The issue of women’s economic empowerment, through the focused lens of paycheck fairness, will provide opportunities for our individual members, WRJ sisterhoods, WRJ Districts, Reform congregations, and others in the Reform Movement to engage in legislative advocacy, social action efforts, and educational programs. Pay equity is a real concern for our members throughout North America, in Israel, and around the world. The injustice of unequal pay persists in society at large and within the Jewish community, where our faith values compel WRJ women to lead the charge to right this wrong. The WRJ pay equity initiative will create partnership opportunities within and beyond the walls of our synagogues, connecting to other religious and secular organizations to unite in the fight for women’s equality. Perhaps most importantly, we take this opportunity to begin a conversation about women’s equality in the workplace, in society, and in our personal lives to ensure that the next generation of women will not face the same injustices women face today. At the WRJ Assembly 2015 Opening Plenary on November 4, 2015 after hearing from WRJ Jane Evans "Pursuit of Justice" Award winner Lilly Ledbetter, WRJ voted to adopt a resolution in support of equal pay for equal work. Read the resolution and take action today! Introduce the topic of pay equity by reading Lilly Ledbetter's book Grace and Grit: My Fight for Equal Pay and Fairness at Goodyear and Beyond with your sisterhood, congregation, and community. Use the WRJ discussion guide to help initiate your conversation. On average, women working full time in the United States are paid just 80 percent of what men in comparable positions are paid. Sadly, the gender pay gap exists also within Jewish institutions at similar rates. The leadership of the Reform Movement recognizes this problem and has created the Reform Pay Equity Initiative to create change on this critical social justice issue. Through this effort, we are comprehensively assessing the salaries of the professionals who serve Reform institutions, developing a plan to address inequities, and evaluating the impact of interventions. Comprehensive tools and strategies to address the gender wage gap will be developed to help integrate best practices into every stage of employment, engaging both employers and employees. Leading experts will conduct trainings for different stakeholders, including board members, search committees, and Movement professionals. April 4, 2017 - Equal Pay Day 2017: This date symbolizes how far into the year women must work to earn what men earned in the previous year. April 10, 2018 - Equal Pay Day 2018: This date shows not much quantitative progress has been made since last year. Wear red! Women around the world mark this day by wearing red and posting photos of themselves on social media. Make sure to use #WRJWearsRed in your Equal Pay Day photos! Join the ‘Twitter Storm’ by sending a tweet on April 10th at 2:00 pm using #EqualPayDay. 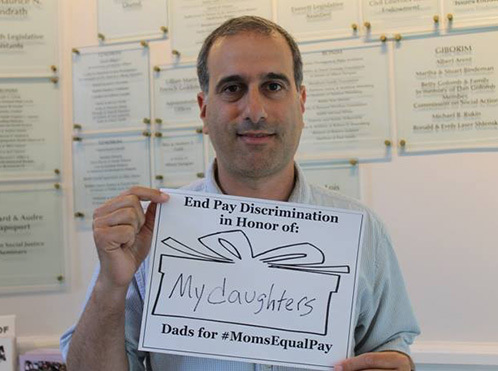 Download the National Committee on Pay Equity Equal Pay Day Kit for legislative information, sample letters to the editor, OpEds, and other useful tools. April 2, 2019 -Equal Pay Day 2019; visit Reformpayequity.org for sample sermons and educational materials around the holiday. Educate your sisterhood and congregation on current legislative efforts to close the gender wage gap in the U.S. and Canada, including Jewish calls for pay equity and a brief history of existing legislation. Find program ideas for your sisterhood and congregation, including legislative exercises, important questions to ask in your community, book clubs, and more! Use the Equal Pay Living Talmud for inspiration when talking about pay equity in your communities. Includes quotes from Jewish texts and prominent Jewish individuals.